Réigiún tíreolaíoch is ea an Aigéine, a chlúdaíonn oileáin agus tíortha éagsúla atá suite san Aigéan Ciúin. Níl aon sainmhíníú amháin le fáil, ach deirtear gurb iad na tíortha atá lonnaithe sa réigiún seo ná an Astráil, an Nua-Shéalainn, an Nua-Ghuine Phapua, an Tíomór Thoir agus na háiteanna san Indinéis a luíonn ar thaobh oirthearach na Líne Wallace. B'é an taiscéalaí Francach Jules Dumont d'Urville a chum an téarma seo, sa bhliain 1831. Tá an réigiún roinnte i gceithre réigiún éagsúla - an Mhicrinéis, an Mheilinéis, an Pholainéis agus an Astraláise. ↑ Regions and constituents as per UN categorisations/map except note 2. Depending on definitions, various territories cited below (notes 3-5) may be in one or both of Oceania and Asia or North America. ↑ The use of this term is disputed. The UN designation for this subregion is "Australia and New Zealand." ↑ 3.0 3.1 Christmas Island and Cocos (Keeling) Islands are Australian external territories in the Indian Ocean southwest of Indonesia. ↑ Indonesia is generally considered a transcontinental country in Southeastern Asia and Oceania (An Mheilinéis); population and area figures are for Oceanian portion only, east of the Wallace line. ↑ East Timor is sometimes considered a transcontinental country. 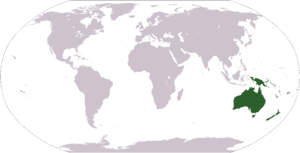 It is geographically in Oceania (Melanesia), but has historical, social, and political connections with Southeastern Asia. ↑ Excludes the US state of Hawaii, which is distant from the North American landmass in the Pacific Ocean and frequently reckoned in this region. ↑ Fagatogo is the legislative and judicial seat of American Samoa; Utulei is the executive seat. Tugadh an leathanach seo cothrom le dáta an 26 Márta 2015 ag 18:29.